It's already the middle of the week. We are almost there. This is my third post as a Growing In Unity gal. Remember to follow all my five posts this week and leave comments in all for a chance to win stamps from Unity Stamp Co. The post today will feature two cards. The first one is a CAS style. Clean And Simple means the project is very easy to replicate and it usually also has one dimension. I used the same Stamp (image of bottles) and repeated it in a pattern alternating different ink colors. Below that pattern I sprayed some color and when dried I stamped the sentiment right on the cardstock. I added some sequins and the card was done. I started this second card with cardstock base to which I glued some patterned paper divided in two pieces and purposefully misplaced them so they are not aligned. Why? Because I wanted it to be imperfect as the sentiment reads. Separately I stamped the image and colored with watercolor pencils. I made a border frame with patterned paper and applied glossy accents and glitter. I adhered the image to burlap and then placed the frame border with dimensional adhesives to make it pop. The sentiment was stamped in the upper left corner and added mini sequins for a final touch. Hope you liked these cards and that you can get some inspiration for your own projects. Again... Don't forget to comment below and in my Facebook page. You'll find me as Scrapper Myra. But there's more... I will share the link in my Facebook page too. If you like my page, and also follow the Facebook posts interacting with likes, comments and shares, you will participate in another draw to win a kit from Unity (this one"s on me!). Love both of your cards. I especially like the multicolored pattern you did with the the wine bottles. I love both your cards! The cussing and drinking one fits me and my friend to a tee! Lol! I love the imperfect paper placement on the second card. And the glitter- omg so pretty! Great CAS card and I love your 'imperfect' touch to the other card. It really adds to the sentiment! Both projects are great! I like the idea of off setting the background, it adds a lot of interest! Both card are great but I really like the wine bottles!!! Love your cards! I really like the wine bottle background that you created! I love C & S cards. I like them both, but really like the layout of the second one. Very beautiful! You are very talented. Both of these are great! Love the imperfect background on the second card! Both well done cards! I especially liked the "imperfect" one. The burlap gives the impression of a woven grass mat under the image. Love these! The "imperfect" one is just stunningly beautiful. I love your attitude! 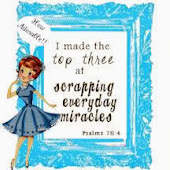 Makes your creations so awesome and special! To receive either one of these cards would be sweet! Love your attitude! Both cards are just great. Adorable cards! I love the wine bottles in multi colors. My step-mom loves her evening glass of wine. I may need to get this stamp! HA! I love that sentiment with the bottles! The beach girl is gorgeous! Love the colors! I am loving all the different ideas that are shared. Oooh, that sparkly frame around your beautifully colored image is amazing and I love the sentiments on both of your projects. The wine one just cracked me up but your style is gorgeous in both! Both cards are so pretty, but I really love how you colored the girl. ❤️Thanks for sharing your projects with us. Beautiful cards! I like the shimmer and the layout that you used. Thanks for the inspiration. I appreciated the purposeful misalignment. Well done. La de los vinos me encanta! Los colores, el stamp y el pensamiento están espectaculares! Now I need the morals stamp.... My wish list should just be the Unity catalog. As for your other card. I'm stealing the way you used those rhinestones! Another great project! 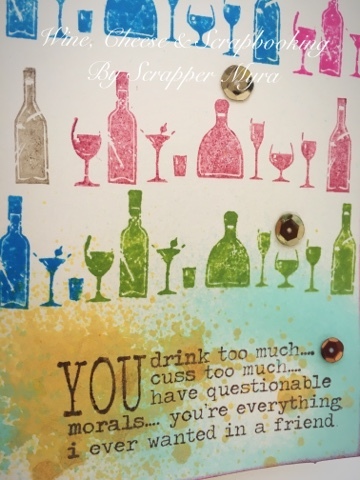 Haha, the wine card is so cute and whimsical and that sentiment is hilarious!! I can think of a few friends that would love it. Awesome cards! 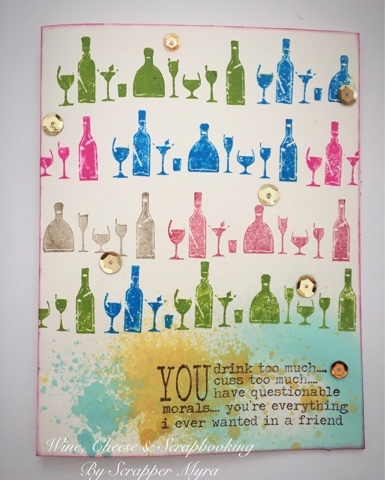 Love the colors and the sentiment on your wine card! And a lovely card with the glittered frame too! Pretty stamp!